I’ve quite enjoyed some #astrophotography over the last few months but I’m stuck with about 30 second exposures with my alt-azimuth mount. Anything longer and I just get streaks. I see the new Ioptron ZE25 equatorial mount is getting good reviews and is hefty enough to take my 80mm refractor and DSLR side by side. I stepped out tonight to check that Polaris is visible from my patio so that I can polar align – no problem! Time to upgrade? I also tried out step down rings tonight to see if I can convert diffraction spikes on a DSLR lens into circles – worked well over 30 seconds! Ive got a guilty astronomy secret – -Ive never seen Jupiter’s great red spot – until tonight. 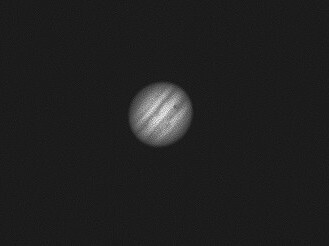 Anytime Ive looked, I havent been that sure and since Jupiter rotates every 10 hrs, there is a fair chance it wont be visible. To help with this, I downloaded Sky and Telescope magazine’s JupiterMoons app for iPAD which has a GPS animation of Jupiter revolving so you know when the GRS will be there. 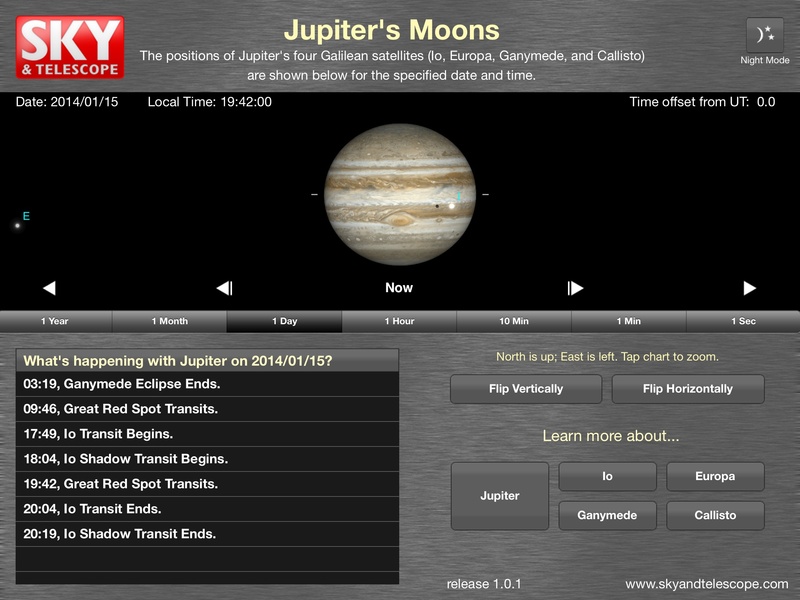 It also shows you the transit times of Jupiter’s 4 moons and the shadows that they cast on the planet. 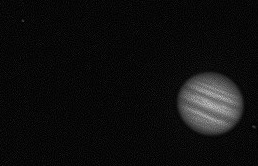 Armed with the information that the GRS would be right in the middle of Jupiter at 1942 hrs and Io would be casting a shadow as it transited, I set up with the Nexstar 8SE. I used a 31mm Hyperion eyepiece to get aligned then gradually worked down through a 10mm Delos, (x200 mag) 8mm Vixen VLW (x250 mag) and 5mm Vixen NLV (x400 mag) eyepieces. The best views were with the Delos – I could clearly see the GRS and the shadow of Io as it transited at about 1920 hrs. I just had time to do one very quick CCD run in B&W at about 1940 hrs in which you can make out the GRS as a sort of belt buckle in the middle of the lower dark belt of Jupiter and the shadow of Io – well, thats, the little dark spot to the upper right of the same belt! I’ve mostly concentrated on DSLR imaging of deep space objects over the last few months but I do have a small black and white CCD camera. As the Moon was so full and bright tonight, I thought I’d have a go at Jupiter and the Moon – the two brightest things out there. 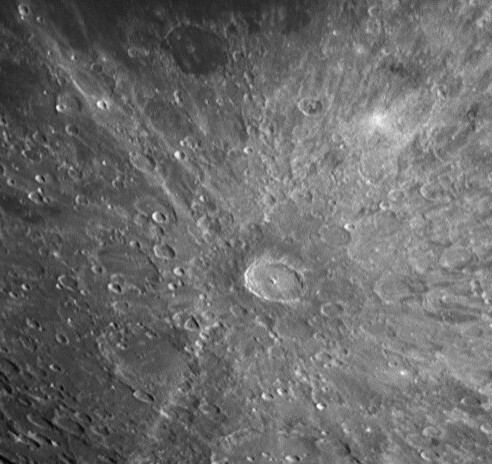 images stacked and edited in Registax 6. Sinus Iridium – The Bay of Rainbows is at the upper right. 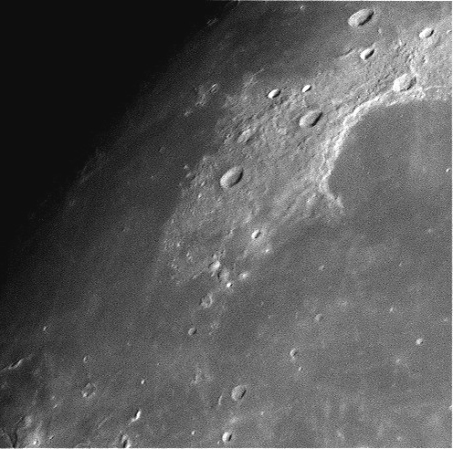 Bianchini is crater that almost enters it. Its nice to spend a sunny saturday morning with a hot cup of coffee safely observing the Sun – especially when there is such a large sunspot (AR 1944) visible. 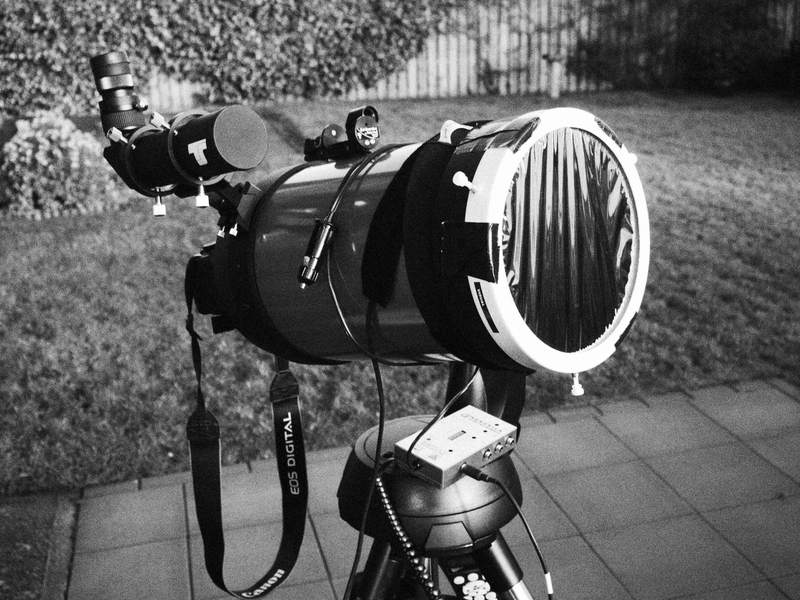 I have a special solar filter made by Kendrick which fits over the front of my scope to protect both it and my eyes/camera. It is both screwed and taped on for safety! Please note that my spotter scope is covered up and that I do not directly observe the Sun at all! 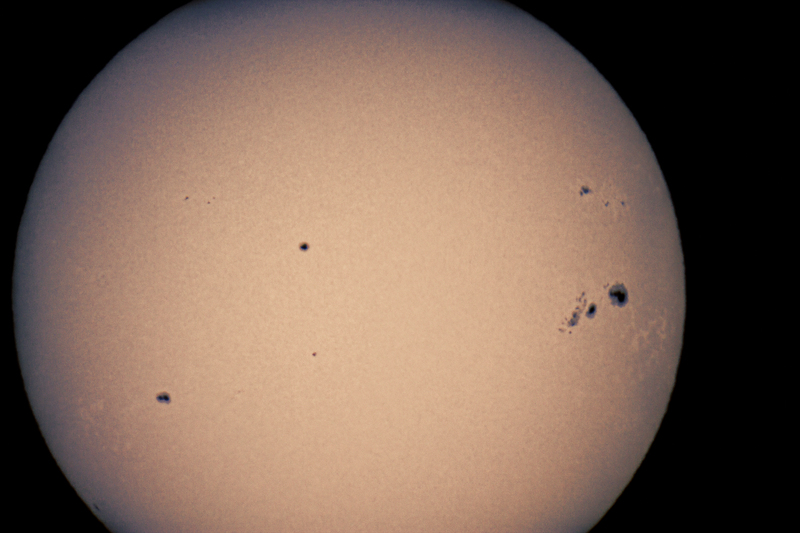 There is a special device called a Sol Searcher made by TeleVue on top of my scope which throws a very small image of the sun on a screen to help me locate the Sun, after that the scope tracks the Sun using its onboard computer. The Sun is viewed through the LCD screen of the camera or on my laptop via Backyard EOS. I attached my Canon 1100D to the scope with a 2 inch M48 connector. These images were taken at ISO 100 at 1/400 second. The cyanotype duo-toning is just to aid contrast. 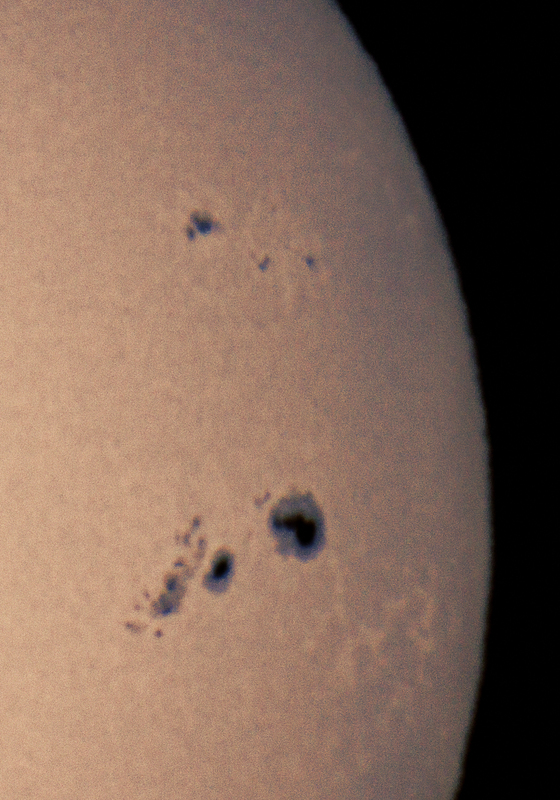 The sunspots and surrounding penumbrae can be seen along with some pale faculae lines. 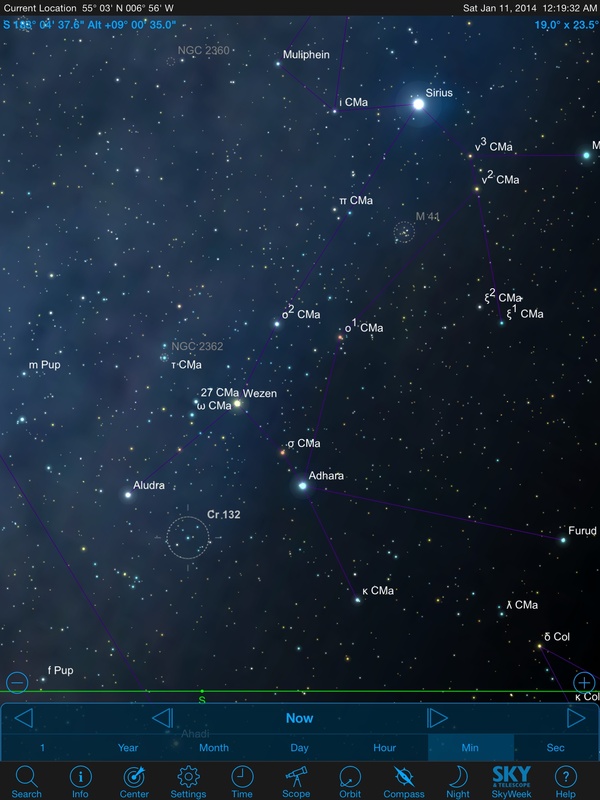 This month’s copy of Sky and Telescope magazine suggested that 2 Collinder open clusters low down below Sirius make good targets for binoculars. Sirius currently transits due South at about 0030hrs and is then at its highest. That gives me the best chance of seeing objects below Sirius. Open cluster Collinder 132 was the higher of the pair. Collinder 132 (Cr 132) is low and to the left in this image. It is just above the Southern horizon. It was easy to find the small triangle of stars down and to the left from Sirius (containing PI CMa). I could just spot Messier M41 to the right of that. Working down from there, I could find the bright yellow star, Wezen. I could confirm this by seeing two small pairs of objects to the left of it. Unfortunately, that’s as low as I could go. A neighbour’s house prevented me from getting those last few degrees down to the horizon (green line). I guess that’s the problem with living at a relatively high Northern latitude! There would be no problem seeing Collinder 132 in Tenerife!